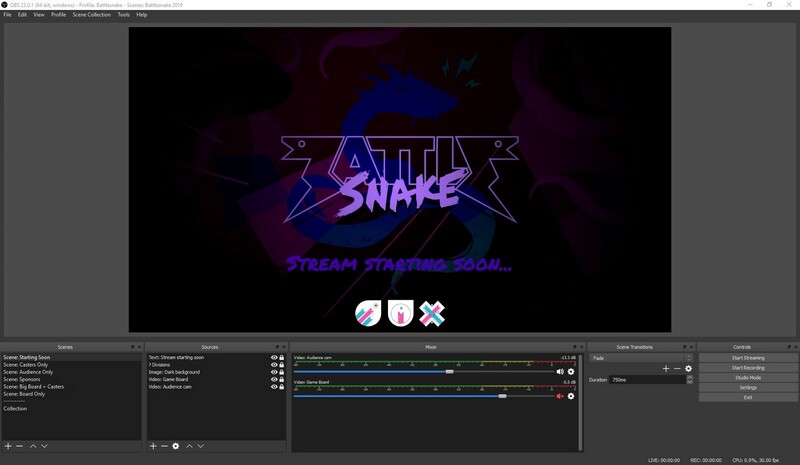 This post will illustrate how I engineered and hosted the Twitch live-stream for the 2019 Battlesnake Victoria event... on a very tight budget. It was an intense tournament between some of the best and brightest developers in Victoria, all vying for a piece of the over $14,000 in prize money. The competition was fierce and atmosphere was alive with cheers and applause. Battlesnake Victoria has always been an in-person competition ever since it started, but for the last 2 years we’ve also live-streamed it on Twitch. The live tournament games shown on the projector screens. The audio and video of the shout-casting crew. Audio from the stage microphones (MCs on-stage). Audio from the in-room DJ. The Beginner Division had over 110 teams this year! The planning process for the live-stream began with sketches of the physical setup we’d use inside the conference centre. Once we had a plan, we’d start acquiring the streaming equipment required. 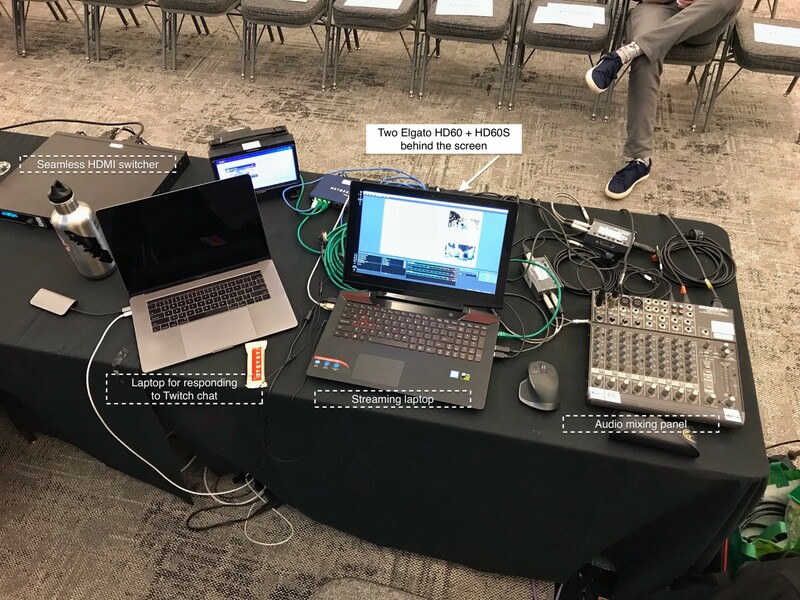 The day before the tournament I coordinated with the AV tech crew at the conference centre about what specific equipment was necessary to capture both the microphone/stage and DJ music audio feeds separately. We knew we needed separate feeds so we could strip the music from our videos afterwards and avoid any copyright claims when the final cut was uploaded to Youtube. This is mainly due to one song in particular, beloved by the Battlesnake community that has unfortunately caused copyright concerns in the past. Fortunately the AV techs knew exactly what I wanted and were able to help make this work inside the conference AV setup. Another big concern was that the stream needed a reliable internet connection. We’d had unreliable wifi in the past at this venue, despite their reassuring everything would be okay for our streaming needs. I wasn’t going to take the chance, and made sure that we had at least one hardwired ethernet line available for the streaming laptop. Shout-out to the AV techs who were onsite the day of the event! They were incredibly helpful in solving out technical issues with short notice — sometimes minutes before something would happen on stage that required it! The past few years the Battlesnake tournament has included on-stage “shout casters” and this year would be no exception. However, this year we also wanted them interacting with the live-stream audience as well. Constructing a setup where the casters could address the room and the live-stream audience seemed daunting, but actually turned out to be fairly simple. A behind the scenes shot of the casting table, and our setup for running the tournament. Our fantastic shout-casters Curtis and Chris. Having a camera on them to get interactions like this was a must. 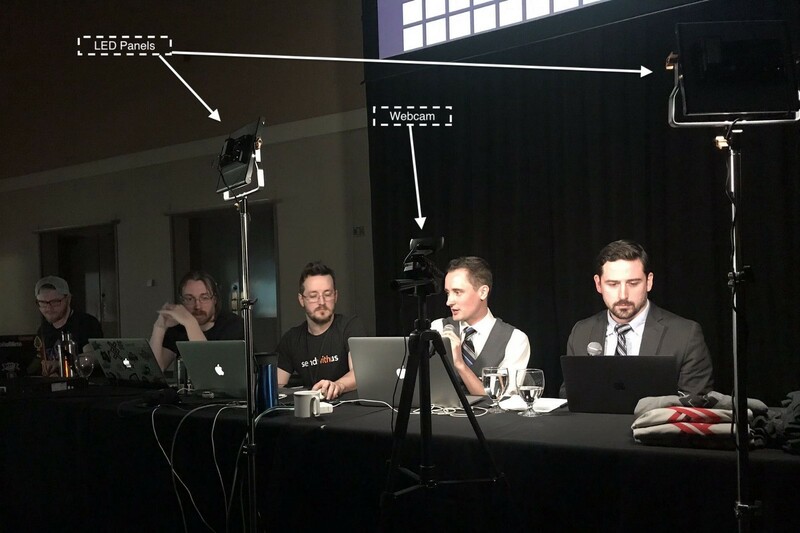 Another constraint we had to work with was requiring the casters to control the playback of tournament games (start, stop, replay, etc), and somehow get the output of their laptop to both the projector screen AND the live-stream in real-time. The AV techs accomplished this by using an HDMI splitter to provide a dedicated HDMI feed from the casting laptop for the streaming laptop to consume directly. Replay control allowed the casters to interact with a game that had finished and talk about the moves that the snakes made before their demise. We’ve always wanted an audience reaction camera for Battlesnake, and this was going to be the year. I used my own personal Lumix G85 with a 12–35mm lens outputting to clean HDMI in FHD@60fps mode mounted on an inexpensive tripod. The audience camera pulling double-duty for a stage cam — Something we’ll change for next year! Last year was supposed to have a similar setup but due to an unforeseen technical difficulty, the audience reaction camera was redirected to point at both the screens. Fortunately we planned for that this year, and we knew our setup would work this time through many, many dry-run tests. 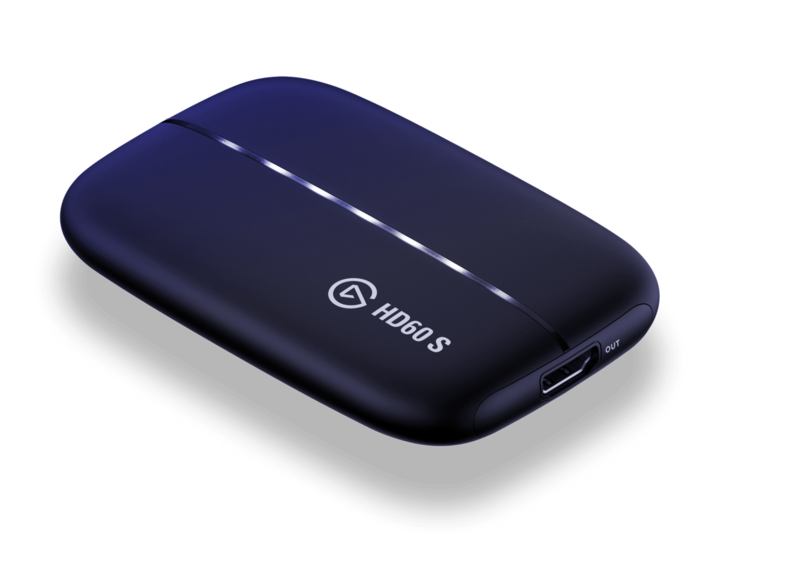 Both the audience camera and the dedicated casting laptop HDMI output were received by two Elgato HD60S and HD60 USB capture cards that recorded the respective video feeds. These HDMI captures cards are amazing for how small and compact they are; they’re powered by USB (HD60 is 2.0, HD60S is 3.1), and the form factor is about as thick as an Apple Magic Mouse. These capture cards are natively supported by OBS as a “Video Capture” source on Windows, however if you want to use them on macOS/OS X you’ll need to use a “Window Capture” source and capture the Game Capture HD software window. There’s a performance hit in doing so, however if you need it in a pinch it might work for you. Both of these capture cards receive audio through the HDMI feed, however we opted to configure them to receive audio on the analog 3.5mm TRS port on each card so we could also receive the microphone/stage audio on one, and DJ music on the other. This also meant we could monitor and receive & record audio on separate tracks, which was one of our goals. I wasn’t able to get a third capture card in the mix due to budget constraints (I had no budget 😂), so we didn’t get a separate stage camera feed. This is why the scene changes between audience and stage are just me panning the audience camera to the left. Maybe next year! OBS with all of the scenes and sources loaded in. After not touching it for a few months, I had to re-learn how to use OBS. 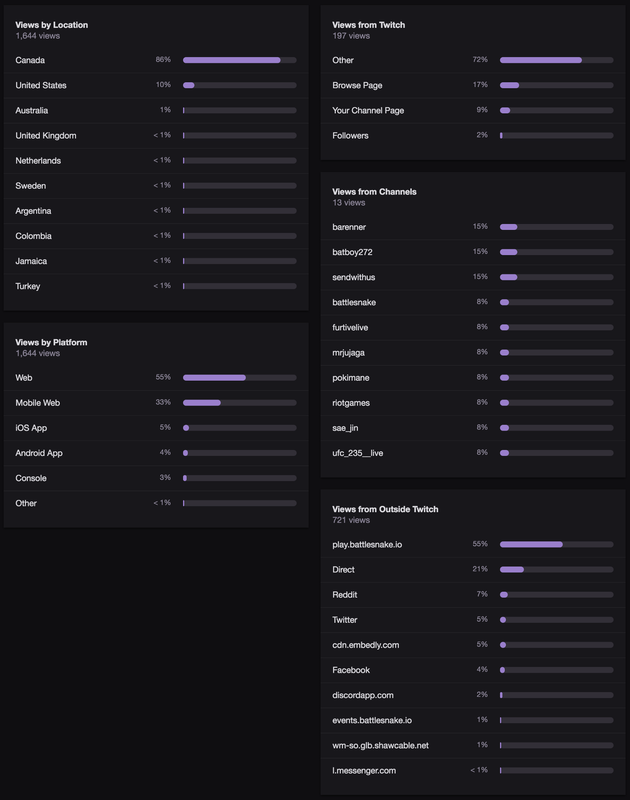 OBS, or Open Broadcasting Software, is an open source cross-platform application that allows you to broadcast content to a provider on the internet (ie: Youtube, Facebook Live, Twitch.tv, etc). In OBS, input content is configured as “sources” and added to “scenes” on a canvas, similar to how you would manipulate objects in photo editing software. Once you have scenes set up, you can transition between them while streaming. You can even record to your local disk while also streaming. This is a huge deal when you want to record your content and edit it later without having to download it from where you streamed it to (if that is even an option). 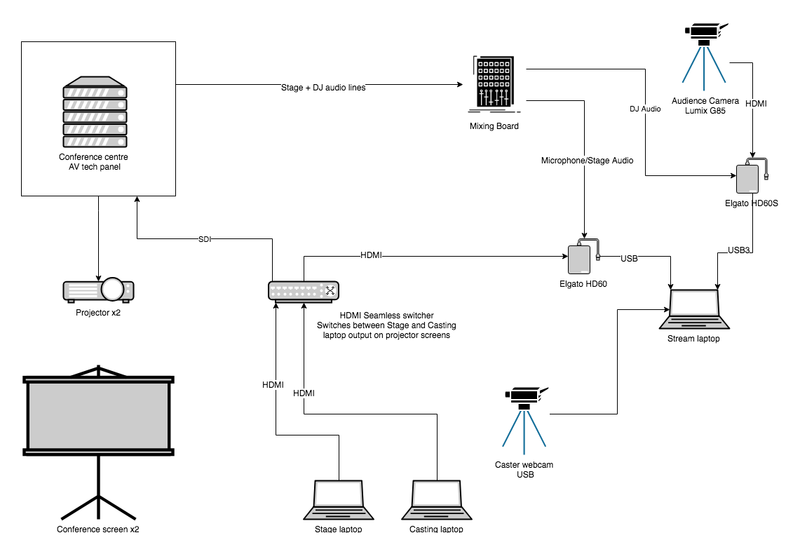 One piece of the puzzle that I left out of this diagram is a second laptop to monitor Twitch chat. The stream audience was very friendly and supportive of the competitors and casters throughout the entire stream. The stream went for a solid 3 hours and 45 minutes, peaking at 145 simultaneous viewers with over 980 unique views throughout the tournament. We were very happy with these results! 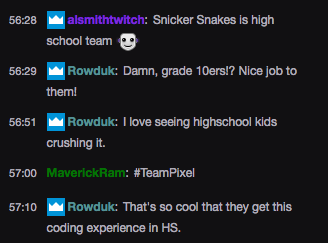 It received over 1,700 total views and generated some buzz in the chat with 44 unique chatters, some of which had never heard of Battlesnake but stuck around to watch anyway. 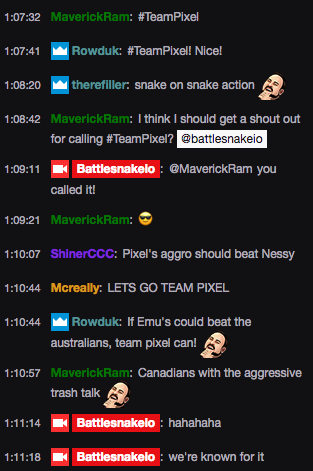 There were even people that arrived in the chat in search of “competitive Snake”, unbeknownst that Battlesnake existed until their arrival to the stream! The people who turned up to chat were some of the most supportive commenters around. The casters acknowledging the Twitch stream viewers. Want to know more about Battlesnake? Program and deploy your own snake right now at https://play.battlesnake.io!